The new sensor impresses, as does the 45-point autofocus system backed up by excellent live view AF, while the newly designed graphical interface will certainly make this camera even more appealing to new users. The absence of 4K video and the quality of the exterior materials disappoint, but this aside, if you're looking for a well-rounded and easy to use camera for your first DSLR the EOS Rebel T7i / EOS 800D is certainly worth a look. The Canon EOS Rebel T7i (known as the EOS 800D outside the US) is the latest in a long line of entry-level Canon DSLRs that can chart their heritage back to the original EOS Digital Rebel (EOS 300D) that arrived back in 2003. Since then, the various iterations and updates that have come and gone have been firm favorites with both new and more experienced users alike. Canon's current EOS Rebel T6i / EOS 750D has established itself as one of our favourite entry-level DSLRs. It's packed with a range of features perfect for the new user, while the polished handling makes it a pleasure to use. But that camera is now two years old and beginning to show its age, and with Nikon updating its entry-level range with the likes of the D3400 and D5600, and with a slew of new mirrorless rivals from various manufacturers being thrown into the mix, an update from Canon was always on the cards. While the EOS Rebel T7i / EOS 800D sports the same 24.2MP resolution as the Rebel T6i / EOS 750D it replaces, the sensor has been overhauled we’re told, and uses the same technology we've seen in the EOS 80D. Canon wouldn't elaborate on what exactly has changed, but we can speculate that it uses the same on-chip digital-to-analogue conversion technology that we've seen in the EOS 5D Mark IV to handle noise better. The new sensor is partnered with a new DIGIC 7 image processor. We've seen a DIGIC 7 chip already in the likes of Canon's PowerShot G7 X II compact camera, but this is quite a different proposition. Canon claims it can handle 14 times more information than the DIGIC 6 processor that was in the T6i / 750D, which again should help deliver a better high-ISO noise performance, as well as an improved autofocus performance too. We'll look at the autofocus in more detail a little later, but sensitivity-wise the Rebel T7i / 800D offers a range of ISO100-25,600 – that's an extra stop over the T6i’s expanded 12,800 ISO ceiling, while there’s a Hi setting equivalent to ISO51,200 also available. You’ll just have to select this in the custom setting. Canon has opted to stick with the same 3.0-inch, vari-angle touchscreen display with a resolution of 1,040,000 dots. A slight boost in resolution, or increase in size to 3.2-inches (matching the Nikon D5600), would have been welcome here, but perhaps Canon may have felt improvements were unnecessary here, as it’s already one of the most polished touch interfaces out there. With 4K video capture becoming more of a standard feature on cameras, especially the mirrorless rivals which the Rebel T7i / 800D will be going up against, it's perhaps a little underwhelming to see only Full HD capture offered. Footage can be captured at up to 60p though, up from the T6i / 750D’s 30p, while Canon has equipped the Rebel T7i / 800D with a 5-axis image stabilization system for shooting hand-held footage. Designed to work with video but not stills, the system is designed to counter unwanted camera movement, while IS-equipped lenses will also work in conjunction with the system. There’s also a 3.5mm stereo microphone jack port, but no headphone port to monitor audio – something that’s pretty standard on cameras at this price point. 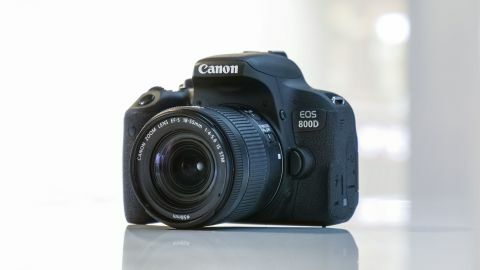 The T6i / 750D supported Wi-Fi and NFC connectivity, and the EOS T7i / EOS 800D builds on this. There's now the option to set up a low-energy Bluetooth connection so that you can always be connected to the camera. We’ve seen something similar with Nikon’s SnapBridge connectivity, enabling you to remotely transfer images from your camera to a compatible smart device. Canon's Camera Connect app also lets you wake the camera from its slumber (provided you haven't turned the camera fully off), as well as browse photos and operate the camera remotely. The Camera Connect app itself has also been updated to make it more user-friendly, and to help guide you through the controls. The arrival of the EOS Rebel T7i / EOS 800D also heralds a new 18-55mm kit lens that’ll be offered as a starter kit with the camera. The Canon EF-S 18-55mm f/4-5.6 IS STM is 20% smaller than its predecessor, and a little slower (the older lens had a variable maximum aperture of f/3.5-5.6) thanks to its collapsible design, but offers up to four stops of image stabilization. As we’ve got our hands on one of the first T7i / 800D’s available we’re using the older lens for this review, but we'll update once the new optic becomes available.